Great blanket. Light weight yet warm. 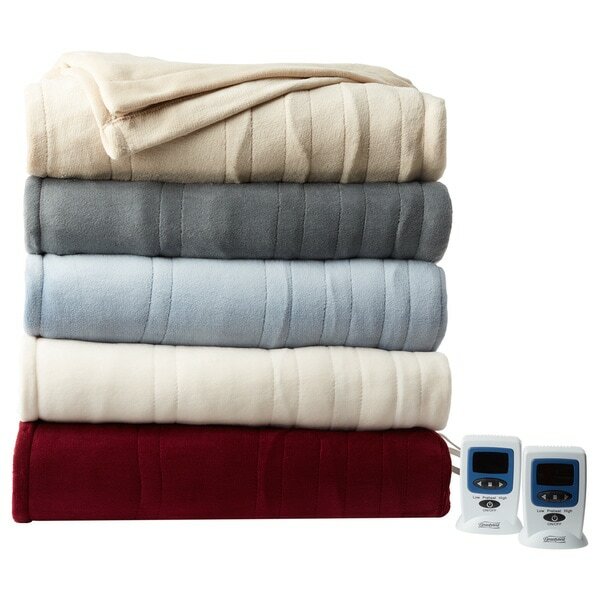 Get nice and cozy with the Beautyrest Cozy Plush Heated Electric Blanket. This blanket features a soft polyester construction in a variety of solid colors to complement your bedroom decor. The internal wiring is flexible for maximum comfort, and machine washable for ease of cleaning. PROS: 1. Heats up very quickly. Set to preheat before heading off to brush your teeth and your bed will be warm as you slip into bed a few minutes later. 2. Blanket is very soft and lightweight. 3. The heating wires are thin so theyre barely noticeable with a sheet between you and the blanket. 4. The color I chose is beautiful  a very rich, evenly shaded dark brown. 5. The control is heavy enough to stand upright on the nightstand w/o easily being knocked over. It has a soft light that shows you the current setting which remains on until the blanket is turned off. 6. Wide variety of settings  4 is barely noticeable. 7 is perfect for me, but my husband prefers 5. Maybe in Alaska on a subfreezing night you might want to turn it up to 20. But I bet not for long. 7. Separate cords are plugged into the two sides of the Queen size blanket so two outlets are needed. This makes it much easier to set up the blanket since a single cord does not need to be fished under the bed from one side to the other. CONS: 1. The connection that plugs into the blanket is VERY difficult to remove. I called Customer Service and they admitted that removing the plug could indeed be a challenge. They said the plug was purposely designed so that it would not easily be accidentally disconnected. They suggested using a pair of pliers to push down on the little button on the top of the plug to make disconnecting the cord easier. SOLUTION: 1. The pliers did not help us, however, we found a solution that worked perfectly. A small C clamp cranked down on the center of the plug provided just the right amount of pressure to release the plug from the blanket. Problem solved. (We used a 3 1/2 inch clamp from the hardware store.) OVERALL: We love the blanket and would definitely purchase it again. I received my blanket in the mail and immediately put it on my bed. I live in Upstate New York and the weather is really changing fast! I couldn't get over how light and soft it was. It has 20 settings and before I go to bed I turn it to 12 and when I get in bed I turn it down to 7. I stay warm all night. I am very happy with it! This is only warm if you have something trapping the heat because the blanket itself is very thin. Also, the cords are many inches apart so your foot can be clean through two cords and be freezing. And finally, the cords are several inches from the edge, making the "electric blanket" effectively 3/4 the size you ordered. This blanket was plenty wide to provide excellent coverage on a queen size bed. The heat controls are easy to use and offer a wide range of heat settings. I am very happy with this purchase! This blanket makes our bed nice and warm but there are two thinks I don't like about it. The first is that the heating elements for each side are separated by about 6 inches down the middle of the blanket causing a 6 inch stripe of cold down the middle of the bed. The second thing is that the material used to make the blanket is not sturdy enough to be able to pull the blanket up when making the bed in the morning. It feels like it will stretch too much or fall apart or disconnect from the heating elements when I pull it up. It's very different from the fabric that electric blankets used to be made out of that was sturdy and thick and felt like it could hold up to decades of use (which many of mine did). I will say the blanket is cozy and I like that it has 20 heat settings and that the controller is made to sit on the bedside table instead of on the floor so it is very easily accessible even when lying in bed. This Beautyrest Cozy Plush Heated Electric Blanket was one of my best purchases ever. I purchased it at the end of the season, so there were only twin sizes left. The twin size actually covers most of a queen size bed. I had been waking up freezing cold at 4:00 a.m. every morning My husband said he did not need an electric blanket. So I thought a twin size would be fine on my side of the bed. Now he loves the electric blanket just as much as I do. I really like the that the control sits up on the nightstand rather than fishing around down by the side of the bed as one would have to do with most electric blankets. The blanket is surprisingly lightweight but very warm. Treat yourself to a better night's sleep! This is a nice blanket. It is soft, heats well, and I like that it has a pre-heat function. The only bothersome aspect is that there is a six-inch wide area down the middle of the blanket that that is not heated. If you typically sleep on one side of the bed, this likely will not be an issue, but if you like to spread out a bit, you will notice that the middle of the blanket does not heat at all. Great electric blanket. Two completely separate controls with separate connection points and plugs. Comfortable for a cold person with blanket running and not too heavy for the other warm person with it turned off. Very plush with lots of heating wires. Purchased a King size to use on an Olympic Queen (66 x 80 mattress) and it fits very nicely. Would definitely recommend it. We bought a queen-size blanket which fits our king-size platform bed very nicely, just a few inches of overlap on each side. Like the range of warmth levels - gets VERY warm in the upper numbers. We use it primarily to warm the bed, then turn heat off when ready for sleep. Would have given it a 5 except for the wires which can be felt to some degree. With a sheet between blanket & skin, wires are barely noticeable. Very good value for the price, just hope it lasts more than one or two winters! I have had it for one month. The quality is aweful. You can feel the wires. The fabric pulls and there are tons of strings/pulls all over it. I washed it per directions. Now it completely stopped working. I am begging them to let me send it back. It is a total lemon! The blanket was fine - nothing to write home about, but OK. But then one of the electronic gizmos stopped working for no reason at all. It's not a good buy if it only lasts a few month. I'm going to try to contact customer service to see if there's any way I can return it! This item worked fine for a little while. Nothing exceptional, but it did work. Bought it in December and now one half of the blanket won't heat. The controller flashes "Error" and won't work. If you are buying something from Overstock, you better be sure you don't want to return it. In a live chat with a customer service rep, I was told that I may be able to get a partial refund. WHAT?! An item that is defective in approximately 90 days from purchase and I cannot get a refund? Wow. I find that unacceptable. I have learned my lesson. I emailed a complaint and the lady who replied was helpful and gave me a $$ refund. Well, its not the $$ plus shipping that I paid, so I am not thrilled, but its better than nothing. I am now in the process of calling the defunct company to try to get it exchanged thru warranty.... not sure if I will get anywhere on that. That's another thing... the manufacturer of beautyrest electric blankets is no longer in business. Keep that in mind. I didn't find that very comforting. Works great, Good name product for respectable price. The material is a soft, cushy cozy plush blanket, and the inner wires while noticeable are barely felt. An "A+" in my book. We had a cold front slide in a couple weeks ago, two days after receiving the blanket, which arrived in good shape and as ordered. It didn't take long to 'install' it and the first night it wasn't turned on. Comfy. The night of the old front, winds were howling and the wind chill dropped to 12 degrees. The blanket was turned on and as we slid under it the only thing heard was 'Ahhh!' Enough said? Ok, some more then. Material is soft to the touch, the heating elements barely noticeable. The controls are easy to read and set, plus they take up very little space since they stand on their ends. Temperature control is excellent and uniform. Good buy, as far as I'm concerned! I like that the control is rather heavy, sits on nightstand and is very easy to read (even without my glasses). I kept knocking my old one off when I tried to change the setting in the night. It is light enough to be comfortable but very cozy and the wires are not noticeable to the touch. Very good value. The feel of this blanket is very nice. It warms up quickly and is very comfortable. Great, soft electric blanket, would buy again. Since I live in a cold environment, I use this on my sofa to keep me warm in the winter. It is cozy when it is on. Well made. The only suggestion I have is to make it washable and dryable. bought this for a very cold few weeks in the Ga mountains,thought I was buying for myself as my husband does not usually like electric blankets but once he tried it while sitting in his recliner I could not get it back. The blanket saw a lot of travel from chair to bed and was so soft and plush. It put out enough heat to keep the person using it very comfortable. I wore my last beautyrest blanket it out. I was very happy to find they still make them and ordered it even though winter is about over. Heats up quickly. The only thing I don't like is the new design on the control. The light is orange and I can't read the numbers without turning the light on. Bummer. I bought this blanket as a gift for my mom as she gets cold sometimes and a normal throw just isn't enough. This has been the perfect remedy, as it doesn't get too warm, and gives her the extra warmth she needs on those colder spring, winter, or even fall evenings. This is a great electric blanket! What I love most about it is the preheat function on the control. The control itself is easy to use and unobtrusive. Very nice quality blanket. It is easy to control so the heat is comfortable for two people at the same time. The material is high quality and not scratchy. It is very much loved by me and my husband. I would highly recommend it to a friend. "It can be wash and dry?" "I would like to plug this into an electric timer. Would this automatically come on with the timer or would I manually have to turn this on every night?" "What color is the Lilac now offered in the listing?" We are working to update the images for this item to show all available options. We apologize for the confusion. "How long is the twin size electric blanket?" "How much does the king size blanket weight?" I can't find the exact weight on the shipping information. It doesn't seem like it weighs very much when it is on the bed. Maybe a little less than our king size comforter. We love this blanket. "The care instructions say it's machine washable, but can you safely put it in the dryer?" Yes, they dry in the dryer quite nicely. Yes but should only dry on air dry or cool but not warm/hot due to the wiring.